Atharva Murali has been marking his space in the film industry with his versatile performance that puts him in par with the best in the trade. The young handsome hero has always been touted by the trade pundits to have it in him to be an impressive action hero thanks to his well toned physique, looks, voice and performance. He has lined up an impressive list of films that are slated for release this year. IMAKKA NODIGAL , one among the much expected films is produced by CJ Jayakumar of Cameo films who had earlier produced Trisha illana Nayanthara . 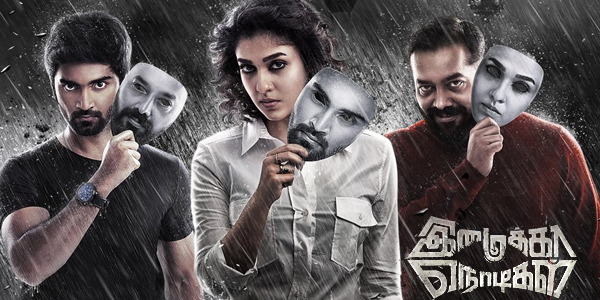 Imaikka nodigal is rated very high by the trade because of the huge star cast and production values. Directed by Ajay Gnanamuthu of ‘Demonte colony ‘ fame, starring Lady superstar Nayanthara in one of her career best roles, Raashi khanna and Bollywood director Anurag Kashyap playing important roles and extended cameo by Vijay Sethupathi. Imaikka Nodigal is attracting the attention of the trade. Adding more value to the film was the stunt sequence the team has shot in Bangalore recently. Cycle stunt specialist from Hongkong Mr.Leehonyiu has been brought down to work on this cycle stunt choreographed by ‘Stun’ Siva master. Producer ‘Cameo films’ Jayakumar said,” When the director shared the idea of this cycle fight ,we decided to make it as stunning as possible. With Atharva in the pedal we knew for sure this action sequence will be much discussed about. We decided to rope in the best of technicians to give the fight an international feel and quality, so we brought Hollywood cycle stunt specialist Leehonyiu from Hongkong. He has done a mind blowing job along with ‘stun’ Siva master. The combination of Atharva-Leehonyiu-‘Stun’ siva-R D Rajasekar and director Ajay Gnanamuthu will give the audience the feel of a Hollywood action film”.